"Per Mare, Per Terras, Per Constellatum." The United Nations Space Command (UNSC) is the military, exploratory, and scientific agency of the Unified Earth Government which acted as the emergency governing body of the human race at large for a time. The UNSC was formed in the 22nd century, a time when remnants of old cultural ideologies clashed for supremacy in the Sol System. The UNSC served mainly as overseer of United Nations military operations in space. After initiating massive militarization propaganda throughout its off-world colonies, through the UNSC, the UN defeated Frieden and Koslovic insurgent forces in a conflict known as the Interplanetary War, which consisted of several side-battles that took place on Mars, the Jovian Moons and the South American rainforests. Although the Interplanetary War brought a great deal of suffering to both the colonial population and the residents of Earth, it also united most of humanity's military forces by the end of the 22nd century. Prior to the Covenant attack on Harvest in 2525, the UNSC was stretched across human space. The most urgent concern was to contain the spread of the Insurrectionists, a violent resistance movement consisting of colonists who wanted independence from the Unified Earth Government. The UNSC fought constant battles in a loosely-defined civil war known as the Insurrection. In an attempt to help end the long-running war, the UEG commissioned the ORION Project and later the SPARTAN-II program, which created elite supersoldiers to combat the Insurrectionists. When the Human-Covenant War began and the alien invaders began destroying the Outer Colonies, these Spartans became humanity's best hope against the technological superiority of the hegemony. When the war began the UNSC, which had been mired in controversy, became humanity's greatest protector. This allowed the UNSC to override civilian rule and establish itself as humanity's primary government. Although the Unified Earth Government was more open to step down, the Colonial Administration Authority, the arm of the UEG ruling over the colonies, resisted the UNSC's rise to power, and was stripped of its influence. Near the end of the year 2552, Earth was the last remaining major human bastion: it too fell under attack by the Covenant. Near-crippled in the aftermath of the Fall of Reach, the UNSC dedicated most of its remaining assets to the defense of the Sol System. The Human-Covenant War finally came to an end after the UNSC and the Fleet of Retribution eliminated the Covenant leadership and destroyed the Flood threat. In its aftermath the UNSC has upheld its alliance with the Swords of Sanghelios and eventually ceded political power back to the UEG. The UNSC is now experiencing a resurgence as it rebuilds humanity's wartorn domain and moves to reestablish itself as a major power within the Orion Arm. Uphold and advance the policies of the Unified Earth Government. Ensure the safety and security of Unified Earth Government territories, possessions, and areas vital to its interests. The United Nations Space Command has its roots in World War I, a conflict which led to the creation of the League of Nations in 1920. Following World War II in 1945, the largely ineffective League of Nations was replaced by the United Nations, creating for the first time in human history a political and military entity that could administrate worldwide economic, social and military matters such as operations and campaigns aimed at providing humanitarian aid and global military intervention with the objective of preserving peace in unstable regions. As space exploration progressed in the 21st century, colonization operations required international cooperation and assistance in order to effectively conduct territorial expansion throughout the Solar System. The International Society of Civil Engineers was formed at this time (2021), an organization that contributed immensely to furthering the quality of space engineering. National-conservative philosophies slowly made way for progressive, international globalization to take effect. An imperative change in worldwide government was necessary to accommodate space colonization demands, which the only global administration organization humanity could rely on. National governments began to lose their overall authority on a global scale, while the influence of the United Nations increased. In 2075, the United Nations created the Unified Earth Government, then as an international think tank tasked with solving the challenges of interplanetary expansion and governmental unification. By 2080, human colonization of the Solar System was fully underway. Offering reasonable living conditions and a physical composition similar to that of Earth, Mars was the first planet to be colonized and soon became a major center of science and industry. Settlements were also established on Luna, the asteroid belt, as well as the Jovian Moons, the latter sponsored in large part by Unified German Republic corporations. Advances in terraforming technology enabled the reshaping of many of the Solar System's formerly inhospitable worlds into sustainable earthlike environments. Human settlement of the Solar System was initially driven more by commercial goals than the comparatively modest programs run by Earth's nation-states. Corporations sought to escape the bureaucracy and laws of national governments and the United Nations that interfered with their operations on Earth. While this resulted in many scientific and technological developments, it also bred suspicions about the ethics of the offworld corporations' activities. In response, the UN enacted the Genetic Rights Act in 2165 in order to ensure the fulfillment of basic human rights in humanity's expanding domain. 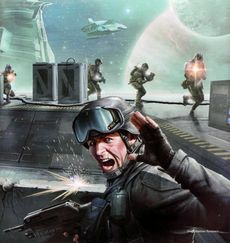 A soldier under fire during a battle within a Jovian installation. As the UN's campaign of centralization and globalization progressed and increasingly more space settlements were being established, ideological political and economic tensions did not disappear with them. With the transition being made from Earth-based capitalism to post-industrial space capitalism, elements on the extreme fringe of the political left-wing saw a rebirth of doctrinal origin, and revolutionary ideas of change once again took the form of military organizations. One of these ideological resurgences centered around Russian-born revolutionary Vladimir Koslov, who proceeded to form a neo-Communist guerrilla armed force named after himself; the Koslovics. The new group of communists aimed to dismantle capitalist systems and corporate power on Earth and in newly-occupied space territories, putting a particularly strong emphasis on liberating orbital installations and orchestrating so-called "workers' crusades," or armed campaigns against their foes on the opposite end of the political spectrum. The Frieden military movement, based in the Jovian Moons and sponsored by corporate powers in the Unified German Republic, reacted once this upsurge of communism became obvious and Koslovic revolutionaries began attacking their infrastructure. Considered a Fascist movement, the Friedens' ardent anti-Koslovic sentiments convinced them to adopt revolutionary ideals as well. Among their primary objectives was gaining corporate independence by seceding from UN colonial administration and establishing a self-contained Jovian state. Frieden propaganda claimed that in order to reach a peaceful (as their German name suggests) and independent Jovian nation, the UN, an advocate of internationalism, was to be driven out of the Jovian Moons and destroyed around the Solar System, including on home ground. Earth's still-disparate, United Nations-aligned national militaries soon found themselves pinned from the extreme left-wing and extreme right-wing alike. These political tensions would soon lead to a final face-down between fascism, communism, and international representatives of democracy throughout various colonies, space environments, and national territories. A battle raging in a Jovian facility. Despite Frieden war-mongering propaganda, the Jovian Moons were still held under tight UN control up to 2160. In March of 2160, the Frieden's led its first revolutionary assault against UN authority, attacking UN Colonial Advisors on the moon Io and giving rise to political reactions on Earth. International UN military forces deployed to the Jovian system, engaging the fascist rebellion in three months of battle. The Jovian Moons Campaign heated tensions within faltering national governments of Earth, paving the way for wars-by-proxy between military corporations, national armies, and political renegades as governments that sponsored colonies in the Solar System responded to Frieden-UN ballistic exchanges and initiated military campaigns of their own, either for their own benefit, or for the benefit or their respective colonies. In a vicious chain reaction, politics on Earth took a downturn to arms mobilization. Following a relatively blurry outcome in the Jovian Moons, Koslovic, Frieden and UN forces prepared for an engagement in South America in the year 2162, one of the most fertile and economically-promising regions of Earth. Presumably in an attempt to gain some material goods from industries in South America, the two military juntas assaulted each other and the UN troops scrambling to defend home territory, culminating in what is now symbolically known as the Rainforest Wars. The conflict in South America resulted in an enormous amount of human casualties, especially in the lines of infantry on all three sides, due to difficult fighting conditions among the continent's numerous mountain ranges, rainforests, wildlife and volatile weather. Real consequences of the conflict, however, consisted of severe starvation and famine on an international scale - which is reason to believe the UN was no longer acting solely as a military defense force in the face of political extremists, but also as a primary provider of starvation relief - along with a further tensing of military conflicts already raging through the Solar System. In the most spectacular offensive since the start of the bloody tripartite war, UN command adopted a military strategy long-forgotten throughout the peace-dominated period prior to the outbreak of the Jovian Moons Campaign in 2160 - the "Blitzkrieg"-style lightning ground assault. After capturing both Frieden and Koslovic forces on Mars, the UN delivered the first space-deployed contingent of the newly-established Marines in December of 2163 on a mission to crush communist infantry encampments in the basin of Argyre Planitia, marking a turning-point in space warfare through dedicated deployments of Marine forces in ground assaults and ship-boarding operations that would follow during the war. The offensive was an incontestable success for the UN side. As a result, military theory and strategy implemented the use of Marines in high-priority missions as a baseline for successful operations, especially within the context of larger conflicts. However, the most important consequence of the anti-totalitarian campaign was of both political and military nature. The United Nations itself did not control a dedicated space military prior to the Mars Campaign, a lacking element which it would replace with a special emergency military force that would come to represent humanity's overall military might. In the wake of the success of the UNSC Marines on Mars, the UN used its growing influence to not only take control of Earth's national governments, but also absorb Earth's national military organizations into a single, organized force; the United Nations Space Command was created. As of 2164, psychological results of the campaign on Mars were formidable; civilian trust in the newly-formed UNSC military was boosted by massive televised propaganda, providing the UNSC with large waves of enthusiastic volunteers from all military services around the world. A sense of urgency, courage and hope helped UN forces scramble extraordinary divisions of Marines, infantry and fliers for a final campaign to annihilate remaining communist and fascist outposts and strongholds on Earth as well as throughout the inner planets and beyond Jupiter. The final campaign for peace lasted from 2164 to 2170 in a series of brutal crackdowns on Frieden and Koslovic hardliners. The result of this war gathered strong civilian support for some sort of powerful international military that could repel revolts and uprisings wherever they may occur. The UNSC emerged as the leading force to further those goals. Almost paradoxically, the war formally ended where it had begun: in the Jovian Moons. The Callisto Treaty was signed in 2170 by commanders of Koslovic and Frieden forces in the presence of UN colonial authorities, definitively ending the 10-year-long conflict with a victory of UNSC forces and democratic leadership. 2170 saw the creation of the first multinational and multicolonial representation of democracy in outer space. Faced with concerns of overpopulation and starvation on Earth, consequently coupled with a looming destabilization of capitalist economy, the Unified Earth Government—up until then lacking concrete power—was formed into a full-fledged governing body in a time of cultural and military reconstruction. The brutal ten-year-long war put the spotlight on problems facing the overpopulated Earth, and the Rainforest Wars also exacerbated issues relating to food distribution; this, along with the UN overmilitarization that occurred during the war, presented immediate problems for the postwar United Nations Space Command. The ensuing famine and societal problems related to the postwar population boom provided the spark to change the political nature of governance on Earth and elsewhere, leading to widespread political reform. 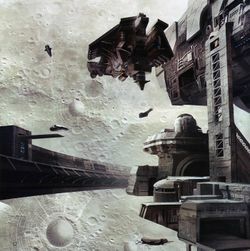 A colony ship readying for departure during the Domus Diaspora. The pressures engendered by the Interplanetary War made space colonization seem more attractive in subsequent centuries, and the Unified Earth Government would sign off on the first large-scale interstellar colony ship program that was revealed in 2310 to ease the burden of an overpopulated Earth. This would not have been possible without the invention of the Shaw-Fujikawa Translight Engine in 2291, which allowed the ships to travel vast distances within a reasonable time by opening portals into Slipstream space. At the same time, the UEG established a separate colonial governing body known as the Colonial Administration Authority as well as the Colonial Military Administration, a dedicated military force to police the colonies. In 2362, the first colony ship, the Odyssey, was launched, beginning the period of human history later known as the Domus Diaspora. This initial colonization effort was concentrated in the Epsilon Eridani system, which would later become one of the centers of humanity's interstellar empire. Vast numbers of citizens and soldiers elected to travel to these new colonies, stabilizing the overpopulation problem on Earth and giving the military new tasks to handle. As the first colonists are stringently selected, the Inner Colonies eventually formed an elite society of the best physical and mental human specimens. A core ring of 210 Inner Colonies were not fully developed until the end of the 24th century. The apex of this colonization movement would come in 2492 when more then 800 worlds were inside UNSC territory, many of them targeted for human habitation. These settlements ranged from fairly well-tamed planetary strongholds to tiny hinterland settlements. During this period, the planet Reach (orbiting Epsilon Eridani, right on Earth's metaphorical doorstep) became the UNSC's primary naval yard and training academy. Reach was a major producer of warships and colony vessels, as well as a training ground for covert operatives and Special Forces. Over the course of humanity's interstellar expansion, a number of alien artifacts were discovered; while unknown at the time, these were the works of a long-vanished civilization known as the Forerunners. However, virtually all of these findings were discreetly concealed by the UNSC's Office of Naval Intelligence, which exerted virtually complete control over the research and information flow about xenoarchaeological discoveries. A noted example of this is Onyx, originally surveyed as an ideal world for human settlement but declared off-limits by ONI due to the alien technology discovered there. By the final decade of the 25th century, a chain of Outer Colonies was providing the UEG with valuable raw materials; the political power, however, remained with the aforementioned Inner Colonies. These differences in wealth distribution and political power, led to new threats of secession from the outer territories. Over time, ideological and political causes resulted in many of the Outer Colonies engaging in open rebellion. A series of brushfire wars across human space sprang up, with hundreds more threatening to erupt as well. By 2511, UNSC estimates, largely based upon the projections of Dr. Elias Carver, put massive, overwhelming, and uncontrollable rebellion at less than twenty years away. Military conflicts began disrupting UNSC authority in the Outer Colonies where several uprisings among working-class agriculturalists and other social classes grew unhappy with the UNSC's largely inconsiderate governance. This unrest gave rise to the Insurrectionist movement, a loose collection of violent colonial separatists with the shared goal of liberating the Outer Colonies from the Unified Earth Government's influence. Spartan-II Red Team in MJOLNIR armor. Fearing the consequences of the possible breakup of their fledgling interstellar empire, while wishing to preserve as much infrastructure as possible, the United Earth Government would embark on a series of covert efforts to quickly and quietly deal with insurrections without incurring massive civilian casualties. Before the UNSC expanded its forays into biological augmentation to create successful Special Forces programs in the 26th century, the Colonial Military Administration experimented with a prototype Special Forces project in the 24th century that tested the effects of bioaugmentations on Marine Corps and Navy personnel. The experiments proved ineffective and were formally canceled as a result, marking the first attempt to create a specialized force of covert-warfare operators in response to insurgent outbursts within the domain of the Unified Earth Government. Due to increasing risk of insurrectionist activity in the late 25th century, the UNSC's Office of Naval Intelligence conceived a project to train Special Forces soldiers in counter-insurgent and counter-revolutionary warfare. The ORION Project, retroactively termed as Spartan-I, was an Naval Special Warfare program, overseen by the CMA, created to train special advanced warfare squads to combat the Insurrection. They became experts in counterinsurgency operations, assassinations, raids, and eliminating high value targets—all considered black operations. However, expectations for the new soldiers were not met, and the project was deactivated in 2506, and all members reassigned to other Special Operations units. In the coming years, ORION's methodologies would be uses as basis for a reform in the Orbital Drop Shock Troopers, the most famed special operations force of the UNSC Marines. Several years later, ONI's alarming projections on colonial instability prompted them to initiate a second generation supersoldier project which would come to be known as the SPARTAN-II program. Partly informed by the pioneering efforts of ORION with new methodologies conceived by Dr. Catherine Halsey, the new program introduced highly unethical aspects such as the covert conscription of mentally and physically gifted children who would be molded into the perfect instruments to quell insurgent leadership and thus prevent the predicted scenario of indefinite all-out war. Physically augmented and equipped with state-of-the-art MJOLNIR powered armor, the Spartan-IIs would prove to be the most effective soldiers fielded by the UNSC, although not in the role they were originally intended for; the attack of the genocidal Covenant quickly saw the Spartans reallocated to combat the new enemy. During the Covenant War, the success of the Spartan-IIs would convince the ONI leadership to use similar methodologies to create hundreds of supersoldiers in the SPARTAN-III program. Despite various refinements in their training and augmentation processes, most of the Spartan-IIIs would be less well-equipped than their predecessors for budgetary reasons, and the majority of them would ultimately perish on strategically important, high-risk deployments. Following the end of the war, the SPARTAN-IV program marked a return to ORION's recruitment protocols, drawing candidates from the UNSC's extant military forces; additionally, technological advances and the relegation of equipment manufacturing to the private sector allowed each operator to be issued with the previously prohibitively expensive Mjolnir armor. With Spartans being created in increasing numbers, their presence across UNSC-controlled space would become far more established and publicized in the years that followed than ever before. The Covenant invade a population center on a human world. 2525 marked the most important turning point in human history. It would mark the beginning of the great technological advancement, the unification of a divided and fractured human race, and the first contact between humanity and extraterrestrial intelligence; the Covenant. It would also see a majority of the UNSC's colony worlds destroyed, with billions killed by orbital plasma bombardment, a technique latter known as glassing. The most important war in the history of the human race began with a disastrous first contact at the distant colony of Harvest. By this time, the UNSC overrode the UEG, and thus became the central civilian authority throughout its territory and Earth itself. Although the central government was more willing to step down given the magnitude of the crisis, the Colonial Administration Authority was far more reluctant. As a result, the UNSC stripped it of most of its power. By the middle to late stages of the war, the government of humanity could be accurately described as an "emergency military" force. Stemming from the chance encounter of human and Covenant forces at Harvest, the first contact made between humanity and the Covenant involved the ship Minor Transgression, and was less peaceful than the second contact made between the two factions. A meeting between representatives of the two factions took place on the fields of Harvest, but the attempt at diplomacy soon turned into a bloodbath. The Covenant claimed the planet for the numerous "Forerunner relics" their luminaries had detected, and slaughtered most of the colony's population. The vast majority of the Covenant remained unaware that the humans they were sworn to annihilate, were in fact the very Reclaimers (mistranslated as "Reclamation") their ancient texts spoke of. On April 20, a scout ship, the CMA sent in a scout ship, the Argo, to investigate the cessation of communications between Harvest and the rest of the UEG's colonies. Before being destroyed by Covenant forces, it discovered that the planet had been incinerated, and its surface covered by fields of magma. Soon after, Battle Group 4, consisting of the frigates CMA Arabia and Vostok and the destroyer CMA Heracles, were sent to investigate. On October 7, the battle group dropped out of Slipspace and to Harvest. In orbit around the remains of the colony world was a single alien ship which proceeded to attack the battle group, destroying them all except one. Intercepted communications identified the enemy as the Covenant, a caste-driven, theological organization made up of several alien species. The message "Your destruction is the will of the gods...and we are their instrument" was broadcast in perfect English. The war for mankind's very survival had begun. Since the later Second Battle of Harvest in 2526, where an enormous human fleet led by Vice Admiral Preston Cole barely won against a single Covenant ship in a symbolic "victory", the UNSC's grip on their territories declined significantly. While the UNSC fought a formidable defensive action against the Covenant's onslaught, the Covenant's technological superiority in space overwhelmed humanity's naval defenses. Over the next 27 years, the Covenant had managed to destroy nearly all of the Outer Colonies, and a portion of the Inner Colonies. Recognizing that it was fighting a losing battle against a superior enemy, the UNSC adopted and enforced the Cole Protocol, drafted by Admiral Cole to ensure that the Covenant never learned the location of Earth as the war continued to spread into human space. The UNSC's military victories against the Covenant were few and far between, with Admiral Cole winning a decisive victory against the Covenant at the Battle of Psi Serpentis in 2543, destroying an entire enemy fleet at the cost of his own life. Behind the scenes, humanity began to extensively reverse-engineer technology recovered from both the Forerunners and the Covenant in a bid to bridge the gap between the Covenant and humanity's technological advancement. The deployment of the Spartan-II supersoldiers proved devastating to the Covenant and enabled the UNSC to stave off several major Covenant offensive operations. However, the Covenant's encroachment of human space continued largely unabated, and the ongoing war of attrition took a toll on the UNSC's offensive capability as the threat to Earth's survival drew closer. UNSC Pillar of Autumn arrives at Installation 04. By 2552 the UNSC, outnumbered and outgunned, had nonetheless managed to slow the Covenant's inexorable progress through human space. However, the situation remained dire. In desperation, HIGHCOM ordered a high-risk operation, sending the SPARTAN-II supersoldiers to insert into Covenant space, capture one or more high-ranking Prophet, and return to UNSC space. With such valuable hostages, the UNSC would then attempt to ransom these leaders for a truce. 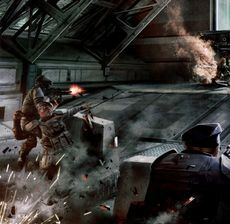 Before the operation began, the Covenant found and destroyed the fortress world of Reach, destroying a large portion of the UNSC's military forces, inadvertently stopping the operation and, seemingly, killing most of the Spartans. A single ship, the UNSC Pillar of Autumn managed to escape the planet, with one active Spartan on board; Master Chief John-117. The ship followed coordinates derived by the AI Cortana to a Forerunner ringworld known as Halo Installation 04. There, John-117 encountered a parasitic lifeform known as the Flood, which Halo had been built to eliminate by destroying all life in the galaxy. John-117 destroyed the ring before it could be fired by detonating the reactors of the Pillar of Autumn. After hijacking a Covenant flagship, the Spartan reunited with the survivors from Installation 04 and the destruction of Reach. This small band of soldiers attacked a force of Covenant ships in Operation: FIRST STRIKE, one of the most successful UNSC operations against the Covenant in the entire war. The UNSC Home Fleet engages the Covenant over Earth. By October of 2552, the Covenant haphazardly discovered the position of the human homeworld, Earth, and sent a preliminary task force there, believing it to be the location of the Ark, an ancient Forerunner relic. They encountered staunch resistance, and were initially fended off. Further complications arose from the political and religious crisis that emerged in the wake of a UNSC operation to assassinate the Prophet of Regret, and the secession of the Sangheili from the hegemony, leading to the Great Schism. Overnight, the Covenant was thrown into chaos. Nevertheless, by November, the forces loyal to the Prophet of Truth had subjugated large parts of Africa and devastated much of the planet. Only the offensive led by Commander Miranda Keyes through the Forerunner portal uncovered in Africa, and the arrival of the Sangheili fleet prevented the eventual destruction of the UNSC and Earth itself. The UNSC and their Sangheili allies launched a joint operation to destroy the Covenant once and for all at the Ark. Fighting against 3:1 numerical superiority in space, and even greater forces garrisoned on the Ark, the allies were able to stop Truth from firing the Halo Array. In addition, the Sangheili known as the Arbiter killed Truth, the Covenant's last remaining leader, while SPARTAN-117 led the ground effort to destroy the Covenant's remaining forces. On March 3, 2553, the Human-Covenant War officially ended in a victory for the UNSC and the Sangheili, but at a high price. Most major military outposts, along with countless colonies had been destroyed. Earth, despite the loss of billions to orbital bombardment, remained battered but standing. An estimated twenty-three billion civilians were killed between 2525 and 2553. "For too many years, humanity was on the backfoot. Reacting to threats, rather than preventing them. Rest of the galaxy was bigger than us. Stronger than us. We were mice, hiding in the shadows, hoping the giants would not see us. No more. Humanity is no longer on the defense. We are the giants now." The commissioning of UNSC Infinity. The UNSC transferred its emergency governing functions back to the UEG on January 8, 2553, although this formal shift of power did not significantly diminish the UNSC's practical authority. Since 2553, the UNSC has engaged in an extensive period of reconstruction in order to restore stability to the shattered remnants of its territory. The UNSC has moved to reclaim those worlds that were not completely destroyed during the Human-Covenant War. Former colonies such as Eridanus II, Meridian and Draco III were resettled and became strategic staging points for humanity's efforts to reunite its reach across space. New planets such as Oban have also been colonized for the purpose of resettling the countless millions of refugees whose worlds were lost in the conflict. The UNSC also aimed to salvage any recoverable military assets lost during the war; paying companies such as Warner & Ives to recover slipspace drives from derelict vessels, and buying scrap from clearing house auctions, such as those in New Tyne on the planet Venezia. The UNSC also maintains its earlier truce with the Swords of Sanghelios under the leadership of Arbiter Thel 'Vadam. In 2553 the Joint Occupation Zones were created and are now governed by both the UNSC and the Sangheili, with former colonies such as Carrow now hosting new citizens from both sides. The UNSC has also established outposts around the Halo Array and other such Forerunner installations, which they closely monitor with the Sangheili. However, tensions remain as insurrectionist movements have grown in strength, with worlds like Venezia and Gao effectively having seceded from the UEG as recently as 2553. In early 2553, the Office of Naval Intelligence began authorizing operations to sow dissent among the Sangheili, disregarding the alliance in the hopes of rendering them unable to fight should they become a threat again. These actions culminated in a civil war between the Arbiter's forces and those who opposed the alliance with humanity. In spite of the catastrophic damage UNSC's infrastructure and personnel suffered during the Covenant War, various secret projects initiated in the final years of the conflict enabled the UNSC to regain some degree of military power in the months after the cessation of hostilities. To symbolize their newly regained strength, the UNSC adopted a revised version of its original emblem shortly after the war. The UNSC's rebuilding efforts were spearheaded by the symbolic commissioning of the UNSC's most powerful warship, the UNSC Infinity, in February 2557. A dramatic modernization of the UNSC's military assets has been ongoing, with new warships implementing both Covenant and Forerunner technologies for use against humanity's enemies. While the reconstruction of humanity's territories continued for many years after the end of the Covenant War, various Covenant remnants, most prominently a group led by Jul 'Mdama, defied the truce that ended the previous war and arose to threaten humanity once again. In July 2557, the ongoing conflict against the new Covenant was joined by the Didact and his Promethean constructs due to an encounter on the shield world Requiem. Following October 28, 2558 the UNSC was largely immobilized by the Created when Cortana and her Guardians took over Earth and most human colonies. UNSC expeditionary forces that managed to avoid the Created's Guardians were able to regroup with the Swords of Sanghelios on Sanghelios. By 2589, the former UNSC stronghold of Reach had been re-terraformed and resettled. A UNSC military HAZMAT team investigates New Phoenix in the aftermath of the Didact's attack. The United Nations Space Command is subordinate to the Unified Earth Government. The professional, controlling body of the UNSC is the UNSC High Command (HIGHCOM), headed by the UNSC Security Council which convenes in HIGHCOM Facility Bravo-6, the UNSC's headquarters in Sydney, Australia. Within HIGHCOM are a number of administrative commands, including PERSCOM, the Medical Corps, the Engineering Corps, Human Resources, and Astrophysics. Legal matters such as the issuing and enforcement of protocols are handled by the UNSC Judge Advocate General's Corps. Research designed to improve the UNSC's operations is carried out by the Internal Audit office. Also under HIGHCOM's command are the UNSC Armed Forces, which handle the defense of UEG territory. Control is exercised through regional CENTCOMs, which have responsibility over certain areas of space. The Armed Forces encompass the UNSC Army, the UNSC Navy, the UNSC Air Force, and the UNSC Marine Corps. The Navy houses the Marine Corps (including the special forces branch of the UNSC Marines known as Orbital Drop Shock Troopers), the Office of Naval Intelligence (ONI), and the Fleet. The Army and Air Force maintain garrisons on colony worlds. When certain rebellious factions began to rise in the 2490s, the UNSC was forced to police its protected colonies tirelessly to keep privateers and pirates from raiding the colonies and any UNSC ships. After 2553, Spartan Operations became the fifth and newest branch of the UNSC, responsible for command of special operations undertaken by the Third and Fourth generations of augmented soldiers. The Spartans are the smallest operational component in the entire Armed Forces. In an effort to maintain a constant supply of service members, the UNSC offers all able-bodied civilians the chance to enlist in various branches of the Armed Forces at automated UNSC recruiting centers. Numerous recruiting centers can be found throughout populated metropolitan areas. The UNSC is also responsible for the overseeing and regulation of commerce throughout UEG space through the Department of Commercial Shipping. The UNSC also maintains the UNSC Symphony Orchestra and the UNSC Jazz Band as ceremonial musical units. By the time the Covenant War began, humanity, and thus the UNSC, had reached Tier 3 of the Forerunner civilization rank system. Humanity's rank continued to rise due to the capture of Covenant technology and equipment, which was studied and adapted for human needs. The very best and cutting edge of UNSC equipment was supplied to the SPARTAN-II project. Human technology was innovative, rather than reverse-engineered from Forerunner technology. This meant humanity remained flexible in their technical expertise, despite being hundreds of years behind the Covenant. One such example of ingenuity was the energy shielding technology adapted and improved for use on the MJOLNIR armor. 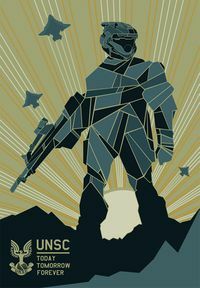 A UNSC propaganda poster on display at the Corbulo Academy of Military Science. "We are UNSC! Today. Tomorrow. Forever." — General Daniel Black quoting the poem "Forward Unto Dawn" in a UNSC recruitment video. The UNSC's pre-Covenant War and wartime policies were viewed with hostility by the civilian populace, especially within rebel movements. Starting with the implementation of the Cole Protocol and martial law, the UNSC's political takeover of the UEG and CMA branches and its generally authoritarian military policies championed over the course of the Human-Covenant War, the UNSC's public image has been stained by rebel and civilian allegations of fascism, totalitarianism and oppression. These allegations are not completely baseless, considering most of this perceived UNSC-directed oppression lies with poor administration in the Outer Colonies, which has led to violent food riots perpetrated by proto-rebellious groups of dissatisfied colonial workers suffering from hunger and poverty at the hands of corporate planetary control. The UNSC also limits the freedom of the press to an extent, a measure put in place by ONI's Section Two after the Inner Colony Wars—allegedly to prevent humanity from tearing itself apart from within. ONI also exerts almost complete control over information about xenoarchaeological findings; any scientists studying alien artifacts are drafted to serve under ONI's supervision. Nepotism is notably prevalent within the organization, sometimes openly; Corbulo Academy of Military Science was based around the concept of training the offspring of high-ranked military and government officials as commissioned officers. French Commandement Spatial des Nations Unies (CSNU) in Halo: Combat Evolved, in the Halo novels until Halo: The Cole Protocol, and in Halo Legends. United Nations Space Command (UNSC) in almost all media since Halo 2. In reality, "UNSC" is an acronym for the United Nations Security Council. The BBC accidentally once used a Halo UNSC logo in a broadcast about the United Nations Security Council. The video on the BBC website was quickly removed. The UNSC's motto is derived from that of the British Royal Marines, "Per Mare, Per Terram,": "By Sea, By Land." 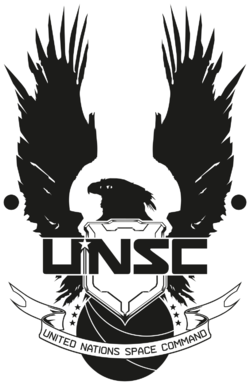 While the new UNSC emblem introduced in Halo 4 is canonically a new symbol the UNSC adopted in the post-war era instead of an artistic retcon of the classic design, all Halo 4 multiplayer maps set during the Covenant War feature the post-war emblem. However, the original, Covenant War-era symbol is appropriately featured in Halo 2: Anniversary multiplayer maps (e.g. Bloodline) and other uses, including labels on vehicles. Due to a lighting glitch in The Master Chief Collection, the war-era UNSC emblem can be seen on the bridge of the UNSC Infinity in the cutscene at the end of the Halo 4 mission Reclaimer. During the development of Halo: Combat Evolved, one working name for the UNSC was the UNSF - or United Nations Space Force. The UNSC Logo used as Halo 4's loading screen. The original UNSC emblem, used until the Human-Covenant War's conclusion. The most recent incarnation of the stylized wordmark. The UNSC roundel used on aircraft. The UNSC roundel used on ground vehicles. An emblem associated with space assets. A post-war UNSC insignia possibly associated with the Spartan branch. An alternate, slimmer, version of the UNSC logo utilised in 2526 at the Corbulo Academy of Military Science. ↑ Halo: The Cole Protocol, page ?? ↑ Halo: Evolutions, "From the Office of Dr. William Arthur Iqbal"